Master Sergeant Todd Eipperle and Congressman Bruce Braley. A Marshalltown Iowa National Guard soldier was recognized today in a ceremony at the Iowa Veterans home in Marshalltown. Master Sergeant Todd Eipperle was wounded in Afghanistan in an exchange of fire with an Afghan security officer who killed two members of Eipperle’s unit. Eipperle killed the security officer and was credited with saving other members of his unit by his action. He was awarded the Bronze Star and Purple Heart. Eipperle said today he has been somewhat overwhelmed by the warm welcome he has received since returning from Afghanistan. He says it’s an honor and a privileged and he says he doesn’t want people to forget the two guys who didn’t get to come home. Sergeant First Class Terry Pasker of Cedar Rapids and retired Connecticut State Trooper Paul Protzenko were the two who died in the attack. Eipperle was wounded in the knee and hip and continues undergoing therapy. Eipperle says most of the therapy has been at Fort Riley, Kansas, and he says he will go back there and expects to be discharged Friday. Eipperle says the rehab is going slow and he says he is feeling “pretty good” and getting stronger, though he hasn’t been able to do any jogging yet. “I won’t ever get all the way back to normal, but getting as close to normal as I can is my goal,” Eipperle says. He will continue therapy once he returns to Marshalltown. 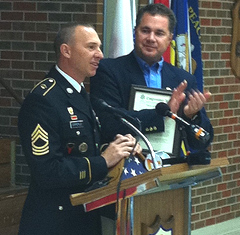 Iowa Congressman Bruce Braley, a Democrat from Waterloo, presented Eipperle with an American flag flown over the U.S. capitol in his honor and a copy of the statement Braley read into the Congressional Record honoring the soldier. Photo courtesy of Congressman Braley’s office.